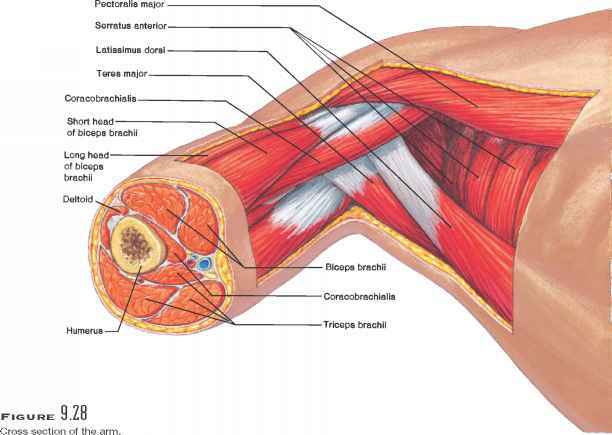 3.5 Segregation happens because homologous chromosomes separate in meiosis. To predict the types of offspring that result from this cross, we first determine which gametes will be produced by each parent (< Figure 3.6a). The principle of segregation tells us that the two alleles in each parent separate, and one allele passes to each gamete. 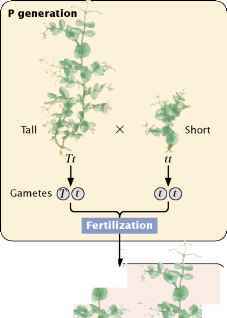 All gametes from the homozy-gous tt short plant will receive a single short (t) allele. The tall plant in this cross is heterozygous (Tt); so 50% of its gametes will receive a tall allele (T) and the other 50% will receive a short allele (t). A Punnett square is constructed by drawing a grid, putting the gametes produced by one parent along the upper edge and the gametes produced by the other parent down the left side (< Figure 3.6b). Each cell (a block within the Punnett square) contains an allele from each of the corresponding gametes, generating the genotype of the progeny produced by fusion of those gametes. In the upper left-hand cell of the Punnett square in Figure 3.6b, a gamete containing T from the tall plant unites with a gamete containing t from the short plant, giving the genotype of the progeny (Tt). It is useful to write the phenotype expressed by each genotype; here the progeny will be tall, because the tall allele is dominant over the short allele. 3.6 The Punnett square can be used for determining the results of a genetic cross. This process is repeated for all the cells in the Punnett square. By simply counting, we can determine the types of progeny produced and their ratios. In Figure 3.6b, two cells contain tall (Tt) progeny and two cells contain short (tt) progeny; so the genotypic ratio expected for this cross is 2 Tt to 2 tt (a 1:1 ratio). Another way to express this result is to say that we expect /2 of the progeny to have genotype Tt (and phe-notype tall) and /2 of the progeny to have genotype tt (and phenotype short). In this cross, the genotypic ratio and the phenotypic ratio are the same, but this outcome need not be the case. Try completing a Punnett square for the cross in which the Fj round-seeded plants in Figure 3.4 undergo self-fertilization (you should obtain a phenotypic ratio of 3 round to 1 wrinkled and a genotypic ratio of 1 RR to 2 Rr to 1 rr). The Punnett square is a short-hand method of predicting the genotypic and phenotypic ratios of progeny from a genetic cross. Probability as a tool in genetics Another method for determining the outcome of a genetic cross is to use the rules of probability, as Mendel did with his crosses. Probability expresses the likelihood of a particular event occurring. It is the number of times that a particular event occurs, divided by the number of all possible outcomes. For example, a deck of 52 cards contains only one king of hearts. The probability of drawing one card from the deck at random and obtaining the king of hearts is 1/52 , because there is only one card that is the king of hearts (one event) and there are 52 cards that can be drawn from the deck (52 possible outcomes). The probability of drawing a card and obtaining an ace is 4/52, because there are four cards that are aces (four events) and 52 cards (possible outcomes). Probability can be expressed either as a fraction (/52 in this case) or as a decimal number (0.019). The probability of a particular event may be determined by knowing something about how the event occurs or how often it occurs. We know, for example, that the probability of rolling a six-sided die (one member of a pair of dice) and getting a four is 1/6, because the die has six sides and any one side is equally likely to end up on top. So, in this case, understanding the nature of the event—the shape of the thrown die — allows us to determine the probability. In other cases, we determine the probability of an event by making a large number of observations. When a weather forecaster says that there is a 40% chance of rain on a particular day, this probability was obtained by observing a large number of days with similar atmospheric conditions and finding that it rains on 40% of those days. In this case, the probability has been determined empirically (by observation). The multiplication rule Two rules of probability are useful for predicting the ratios of offspring produced in genetic crosses. The first is the multiplication rule, which states that the probability of two or more independent events occurring together is calculated by multiplying their independent probabilities. .in a large number of sample rolls, on average, one out of six times you will obtain a four. .so the probability of obtaining a four in any roll is V6. .your probability of getting four is again 1/6. .so the probability of gettinga four on two sequential rolls is 1/6 x 1/6 = V36 . .on average, one out of six times you'll get a three. |4| That is, the probability of getting either a three or a four is 1/6 + 1/6 = 2/6 = 1/3. 4 3.7 The multiplication and addition rules can be used to determine the probability of combinations of events. in the example just considered, we wanted to know the probability of obtaining a four on the first roll and a four on the second roll. For the multiplication rule to be valid, the events whose joint probability is being calculated must be independent— the outcome of one event must not influence the outcome of the other. For example, the number that comes up on one roll of the die has no influence on the number that comes up on the other roll, so these events are independent. However, if we wanted to know the probability of being hit on the head with a hammer and going to the hospital on the same day, we could not simply multiply the probability of being hit on the head with a hammer by the probability of going to the hospital. The multiplication rule cannot be applied here, because the two events are not independent— being hit on the head with a hammer certainly influences the probability of going to the hospital. The addition rule The second rule of probability frequently used in genetics is the addition rule, which states that the probability of any one of two or more mutually exclusive events is calculated by adding the probabilities of these events. Let's look at this rule in concrete terms. To obtain the probability of throwing a die once and rolling either a three or a four, we would use the addition rule, adding the probability of obtaining a three (06) to the probability of obtaining a four (again, V6), or % + /6 = 2/6 = / ( Figure 3.7b). The key indicator for applying the addition rule are the words either and or. For the addition rule to be valid, the events whose probability is being calculated must be mutually exclusive, meaning that one event excludes the possibility of the other occurring. For example, you cannot throw a single die just once and obtain both a three and a four, because only one side of the die can be on top. These events are mutually exclusive. The multiplication rule states that the probability of two or more independent events occurring together is calculated by multiplying their independent probabilities. The addition rule states that the probability that any one of two or more mutually exclusive events occurring is calculated by adding their probabilities. Notice that there are two ways for heterozygous progeny to be produced: a heterozygote can either receive a Tallele from the first parent and a t allele from the second or receive a t allele from the first parent and a T allele from the second. After determining the probabilities of obtaining each type of progeny, we can use the addition rule to determine the overall phenotypic ratios. Because of dominance, a tall plant can have genotype TT, Tt, or tT; so, using the addition rule, we find the probability of tall progeny to be 1/4 + 1/4 + 1/4 = 3/4. Because only one genotype codes for short (tt), the probability of short progeny is simply 1/4. Two methods have now been introduced to solve genetic crosses: the Punnett square and the probability method. At this point, you may be saying "Why bother with probability rules and calculations? The Punnett square is easier to understand and just as quick." For simple monohybrid crosses, the Punnett square is simpler and just as easy to use. However, when tackling more complex crosses concerning genes at two or more loci, the probability method is both clearer and quicker than the Punnett square. 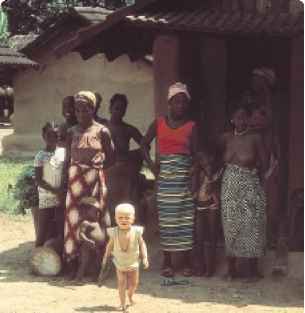 3.8 Albinism in human beings is usually inherited as a recessive trait. (Richard Dranitzke/SS/Photo Researchers.)" first and third children might have normal pigmentation, whereas the second has albinism; the probability of this sequence is 3/4 X /4 X 3/4 = 9/64. Finally, the first two children might have normal pigmentation and the third albinism; the probability of this sequence is 3/4 X 3/4 X 1/4 = 9/64. Because either the first sequence or the second sequence or the third sequence produces one child with albinism and two with normal pigmentation, we apply the addition rule and add the probabilities: 9/64 + 9/64 + 9/64 = 27/64. If we want to know the probability of this couple having five children, two with albinism and three with normal pigmentation, figuring out the different combinations of children and their probabilities becomes more difficult. This task is made easier if we apply the binomial expansion. The first term in the expansion (a5) equals the probability of having five children all with albinism, because a is the probability of albinism. The second term (5a4b) equals the probability of having four children with albinism and one with normal pigmentation, the third term (10a3b2) equals the probability of having three children with albinism and two with normal pigmentation, and so forth. We could easily figure out the probability of any desired combination of albinism and pigmentation among five children by using the other terms in the expansion. How did we expand the binomial in this example? In general, the expansion of any binomial (a + b)n consists of a series of n + 1 terms. In the preceding example, n = 5; so there are 5 + 1 = 6 terms: a5, 5a4b, 10a3b2, 10a2b3, 5ab4, and b5. To write out the terms, first figure out their exponents. The exponent of a in the first term always begins with the power to which the binomial is raised, or n. In our example, n equals 5, so our first term is a5. The exponent of a decreases by one in each successive term; so the exponent of a is 4 in the second term (a4), 3 in the third term (a3), and so forth. The exponent of b is 0 (no b) in the first term and increases by 1 in each successive term, increasing from 0 to 5 in our example. Next, determine the coefficient of each term. The coefficient of the first term is always 1; so in our example the first term is 1a5, or just a5. The coefficient of the second term is always the same as the power to which the binomial is raised; in our example this coefficient is 5 and the term is 5a4b. For the coefficient of the third term, look back at the preceding term; multiply the coefficient of the preceding term (5 in our example) by the exponent of a in that term (4) and then divide by the number of that term (second term, or 2). So the coefficient of the third term in our example is (5 X 4)/2 = 20/2 = 10 and the term is 10a3b2. Follow this same procedure for each successive term.